Today I have another preview for you, but this one isn't with a bunch of polishes, instead it's with pigments to create your own polish! Essence Colour Arts will come out in September (Netherlands) and mid August till mid September (Belgium). Clickable for an enlargement that shows the shimmers and glitters better. This Trend Edition will have 15 pigments (€2,49 each), a nail base that can be used for creating your own polish with the pigments or as top coat (€1,59) and mixing jars for the pigments (€1,29 for 2). It'll also have an eyeshadow base, a lip base and a multi tasker applicator, so if you like to go matchy-matchy with your nails and makeup, this is probably a nice TE for you. 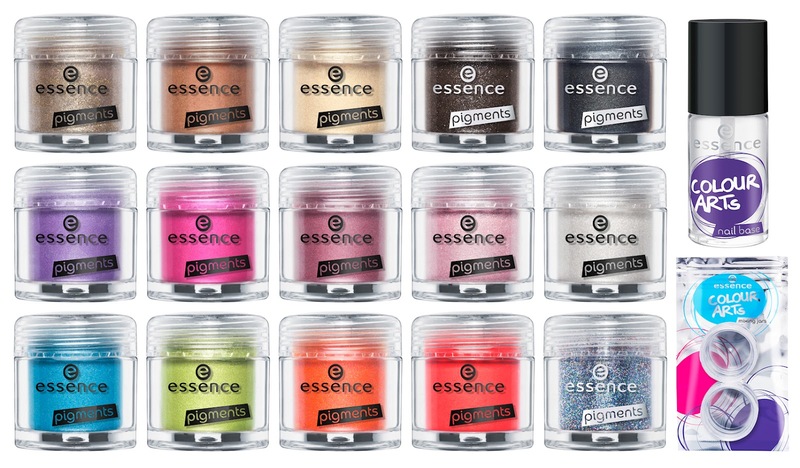 Of course frankening polish and using pigments isn't a new thing, but I like how Essence often comes up with different products to help people get creative with polish. I wonder though if the nail base has little balls in it to help mix the pigments with the polish, but either way, if I get any of these pigments I'd probably use smaller empty bottles and some top coat instead.